Cloud storage is great. If you use multiple gadgets and you do work across them or find times that you need access to a document or resource, it’s nice to have it. I have 5G on Dropbox, 25G on SkyDrive, 5G on Google Docs (I start losing track) but all of them are free. I may also have a Box cloud storage and a few more, all free. Keeping up with what information is where and searching it is tough and I don’t like to constantly reorganize because I have more important things to do. 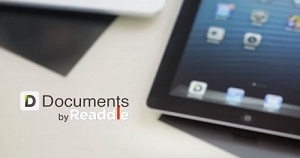 Documents by Readdle, an iOS app (iPad, iPhone, etc. ), corrals all those cloud services and gives you a single interface into all of them. Effectively giving you a combined space so that gives me something like 50G or more of free cloud storage. Now all I need is an Android version and I’m golden. So if you are in the Apple Universe then consider this app.